By offering a small target and protecting their teammates, there are very few openings for opponents to hit someone out. After blocking incoming throws, the trenching team runs to mid-court and throws as a team. They usually hit one opponent, while maintaining possession of 2-3 balls and quickly return to their trenches. This tactic is effective and successful as the trenching team whittles down their opponents, while taking few outs themselves. One problem... dodgeball was never meant to be a turn-based tennis match. It should be a fast paced, adrenaline pumping, head on a swivel, get out of the way, organized chaos! If you get a multi-ball in pinball, you don't hold two and play just one at a time. 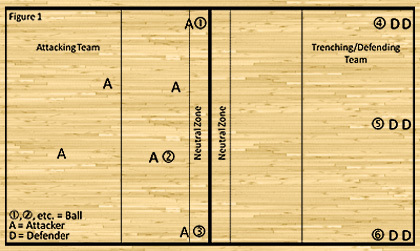 So to bring dodgeball back to its roots, I have provided a detailed counter-strategy on how to overcome trenching. Two players attack from mid-court, one standing on the far left and the other on the far right. In this example, they are attacking the opponents in the back left corner. The left attacking player throws at the blocking defender, drawing their attention and inducing the block. 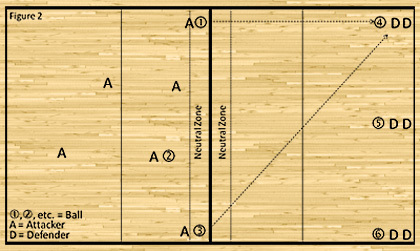 At the same time, the right attacking player throws cross court at the blocking defender, striking the defender on the defender's left side. This maneuver requires power, accuracy and timing. With balls coming from two angles it is difficult for the defender to block one while avoiding the other. Alternatively, the right attacking player may choose to throw at the defender hiding behind the Blocker if that defender is also focused on the ball being thrown in front of them. If you are able to curve the ball by adding spin, an attacking team can attempt to throw the ball over or around the blocking defender to strike the teammate being protected. Consider this strategy when throwing as a team, even if your opponent is not trenching. Throwing from two angles will make it more difficult for your opponents to dodge and catch. Make sure to get the timing down with your teammates as errant or individual cross court throws can turn into easy catches.